Congratulations to Twitter user @Eleuthera1. She is the winner of the Black & Decker Ratcheting Ready Wrench. 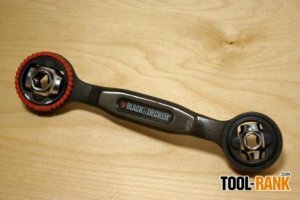 Up for grabs for this month's giveaway is a brand new Black & Decker Ratcheting ReadyWrench. I reviewed one of these not to long ago and found that it is something that just about any homeowner or DIY'er could use. Check out my review of the Ratcheting ReadyWrench to see just what I thought about the tool. Entering the giveaway is simple and we give you three options, here is how. Leave a comment anywhere on the Tool-Rank Blog. Any comment will do, but if you want to say thanks to the sponsor, that would be nice. Or let us know how you would use your new toy. Facebook users can enter by leaving a comment on the ToolRank Facebook page. You may enter this specific giveaway up to three times (once per method). Additional entries will not be counted. Contest is open to anyone in the 48 Contiguous United States (including the District of Columbia), 18 years of age or older. One (1) Winner will be chosen randomly. Winner will receive one (1) of the prizes listed above. If you are chosen, you will be notified by email (Use a valid email address), or PM via Facebook or Twitter. Prizes may look different then those pictured above. Entries can be submitted until Monday February 28 2011, at 11:59PM ET. Good luck! Complete giveaway rules can be found here. Thanks again to Black & Decker for supplying the Ratcheting ReadyWrench.